We appreciate your feedback about your support experience with Jeroen Sormani, developers of WooCommerce Advanced Product Labels. This helps us maintain high standards on the WooMarketplace, and helps Jeroen Sormani improve. Grab your customer’s attention with custom product labels! With the Advanced Product Labels extension you can create labels easily and quickly to grab your customer’s attention. Promote your free products, emphasise “Free Shipping” or other exclusive discounts for one or a range of your products. By using product labels you can attract attention from the customer to the product. You probably already have a ‘sale’ or a ‘promo’ label on top of your products, that nice, but you can take it even further with this extension. Target specific groups of products with the conditions which can be set for each label. What does Advanced Product Labels do? Different label types; Choose from 6 different types of product labels. The extension has two main interfaces, the global labels and the single labels. 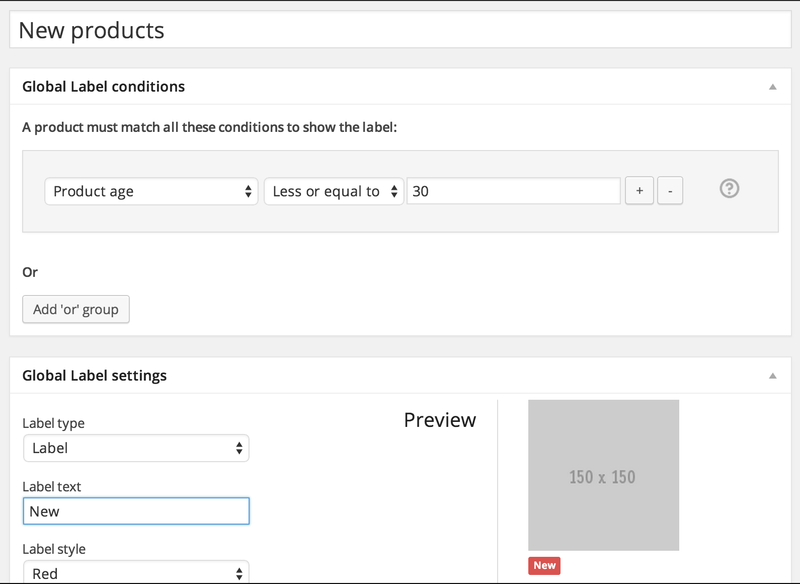 The global labels can be found under the ‘WooCommerce’ -> ‘Settings’ -> ‘Product labels’ settings tab. Here you can target products with the conditions as shown below. The following conditions are included by default. These conditions can be easily modified and/or extended with hooks. The single label interface has the same settings as the global label, only these settings only go for the current product. As an extra setting, you can exclude that product from the global labels. Both label interfaces have a live preview to show you how the label is going to look like.